Find the thief who stole some documents from the Caldera Mine. Ask around the town about some stolen documents. Speak to Irgola and Elmussa Damori. Either kill Elmussa or let her escape. Odral Helvi in the Governor's Hall in Caldera will ask you to recover some stolen Caldera Mining Contracts from the Caldera Mine and find the thief. Asking around town will point you to the two newest people in town: Irgola and Elmussa Damori. Irgola denies any involvement, but Elmussa is somewhat less convincing. If you raise Damori's disposition to around 80 she will admit to the theft and give you the documents. Although you are supposed to kill her, Damori will plead with you not to tell Helvi it was her and to spare her life. She is in the Thieves Guild and will also say that killing her will make you lose standing and just give you a key to get into the chest. Crassius Curio will also recommend letting her go free. The choice is up to you. Return to Helvi to complete the quest. If you killed Elmussa he will be pleased, and reward you. If you let Elmussa escape, you can either lie to Helvi about the identity of the thief or tell him the truth. If you tell him the truth, he tells you that he will arrange to have Elmussa arrested - and she disappears from the game - and give you a reward. To lie successfully, Helvi must have a disposition towards you of at least 70. He will be disappointed and give you a smaller reward. If his disposition is below 70, he will not believe your lie and simply ask you again until you tell the truth. + 20 Disposition, +5 Hlaalu Faction Reputation, +1 Reputation. + 10 Disposition, +10 Hlaalu Faction Reputation, +1 Reputation. +5 Disposition, +10 Hlaalu Faction Reputation, +1 Reputation. 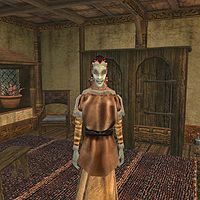 If you turn the thief in or kill her, and you are in the Thieves Guild, you will no longer receive services from guild members you don't outrank (i.e., the stewards). If you let Crassius Curio know what's happening and who the thief is he will reward you with 500 drakes and tell you to spare the thief and lie to Helvi. If you lie to him you will lose +5 Disposition with him and get no cash reward. 10 Odral Helvi told me that a spy has been stealing documents from Caldera. He asked me to find out who has been stealing the documents. 20 Odral Helvi gave me some documents similar to the ones that have been stolen. 40 Elmusa Damori admitted that she is the thief. 41 Elmussa Damori admitted that she is the thief. She asked me not to tell Odral Helvi. 50 Crassius Curio told me to try and spare the thief, Elmussa Damori. 100 Finishes quest Odral Helvi thanked me for returning the documents. 110 Finishes quest Odral Helvi thanked me for reporting Elmussa Damori. 120 Finishes quest Odral Helvi thanked me for killing Elmussa Damori.